Ash storms carry the Blight far beyond Red Mountain. 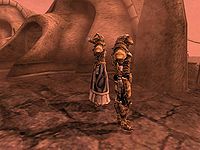 In 3E 427, the ruling powers of Morrowind, already weakened by questions of authority, were further threatened by the re-awakening of the Blight. This ancient curse is carried from Red Mountain beyond the protection of the Ghostfence through ash storms. It is believed to be created by Dagoth Ur as a means to spread his influence, softening defenses and tying up resources of the Tribunal Temple. House Redoran is particularly strained in its territories and maintains great volunteer forces in Maar Gan and Molag Mar. Blight diseases resist regular cure common disease spells, and are of two kinds: wasting diseases which attack one or more of an organism's systems, and abnormal growth diseases, which distort the organism's functions and structures. Natives avoid exposure to the Blight, and wear special protective garments when traveling in regions exposed to ash storms. Those infected can be cured by altars, potions and spells. The Blight also affects creatures, making them stronger and more dangerous to unwary travelers. It affects the profits drawn from the land, leading to closures of mines, especially egg mines. As the infections grew, the Empire laid down an embargo on wares from Vvardenfell, leading to some starvation and further isolation of the Dunmer on the island. The Velothi Mountains and the Inner Sea are natural barriers, protecting the rest of Tamriel from the Blight. This page was last modified on 19 November 2018, at 04:18.